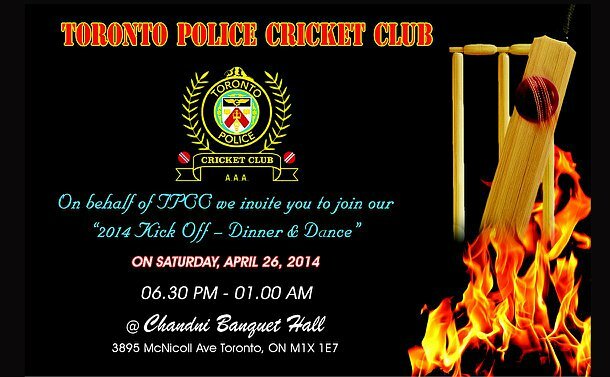 The Toronto Police Cricket Club is kicking off our 2014 season with high spirits and enthusiasm. To celebrate the new season the club is starting off with a banquet full of fun and entertainment. The dinner and dance will also encourage community interaction with a variety of people, ranging from anywhere from Far East to the Caribbean islands as cricketers hail from nations worldwide. The evening will be held at the Chandni Banquet Hall, at 3895 McNicoll Road, beginning at 6 p.m. on Saturday, April 26. In the recent past the club has been an icon with local youth cricketers, as we have played and mentored youth in the community. This year, our Club is also hosting the Worcester City Police Cricket Club, the New York Police Department (NYPD) and Peel Regional Police Service in the North American Cricket Championship in Toronto from Aug. 8 to 10. The Toronto team will also face off against the Worcester City and NYPD squads at a tournament in New York from Aug. 15 to 17. The club thanks you for your support and looks forward to seeing you at the banquet or at matches this season.